When my husband and I bought our house 7.5 years ago, one of the first things we purchased was a plug-in carbon monoxide alarm. I was well aware of the dangers of carbon monoxide, also called the silent killer, and with an oil furnace in the basement we were not going to take any chances. 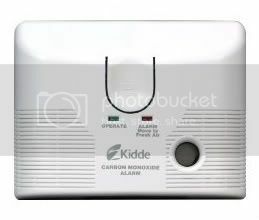 We wound up with an earlier model of this Kidde Carbon Monoxide Alarm . So since then there it has sat plugged into the hall outlet on the main level, silent for those 7.5 years. Until this past Friday, April 1, 2011. At 6:45 AM I am woken not by my children, but by a loud "chirp", very similar to that of a smoke detector. There was then a pause and then another chirp... pause... chirp...pause...chirp and on. As I got out of bed and made my way out into the hallway I quickly realized that it was not the smoke detector. I headed down to the main level to check the carbon monoxide alarm. Sure enough the sound was coming from it and with each chirp the red "alarm" light flashed. At this point the 15 month old is awake so I grab him and then go back into the bedroom to wake up my husband. I tell him about the carbon monoxide alarm and that we need to call the fire department. We agree that we need to get the kids out of the house and on the bus. So I wake everyone up and get them quickly washed and dressed. I put all 4 of them in the twins' bedroom and tell them not to leave the room and I run downstairs to throw snacks in their backpacks and grab their drinks. I probably have never moved so fast in my life. My husband even joked that if he ever needs me to pick up the pace, he's going to set off the alarm again. While I am getting all of this done, daddy pulls the car out of the garage for me so I can bypass the basement/garage and walk the boys outside on the deck to the driveway and car. By 7:30 all 4 boys are in the car. By the way, DVD player in the car was a life saver for me. I popped in a movie for them, ran back into the house to grab their waffles out of the toaster, and then ran back into the car. We had until 8:15 till the bus came for the older 3, so we waited. Then I saw the first volunteer firefighter coming down the road so I pulled out of my driveway and into the cul-de-sac. Once the huge firetruck pulled into our circle I realized the bus was going to be able to come down our road and turn around, so I decided to pull down to the end of the street to meet the bus there. We were there for a bit until the bus arrived. As I was getting them on the bus I saw the firetruck pull up to leave so I am hoping that the quick departure means that everything checked out OK. The baby and I drive back down to our home and I get out first to make sure the coast is clear and it is. The firefighters checked every room in our house and had negative readings in all of them. They said that it was probably time to replace our alarm and that they recommend you do that every 5 years. Apparently our CO alarm likes April Fool's Day. Not amusing for this mom. An absolutely insane morning but in the end everything was OK. We felt bad about causing such an uproar, but it easily could have been much more serious. 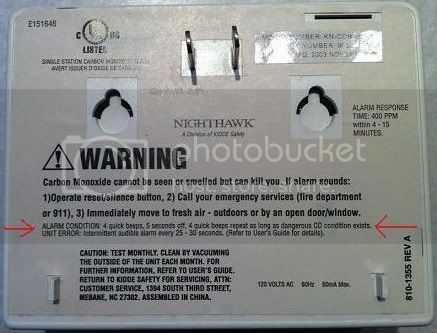 And then my husband picked up the carbon monoxide alarm and read the instructions on the back. Something we probably should have done at 6:45. ALARM CONDITION: 4 quick beeps, 5 seconds off, 4 quick beeps repeat as long as dangerous CO condition exists. UNIT ERROR: Intermittent audible alarm every 25-30 seconds. 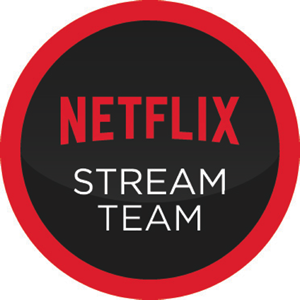 (Refer to User's Guide for details). Yes, this tad of information which clearly indicates that what we were hearing was just an unit error, would have been so much more helpful a little earlier in the morning. The moral of the story? Check your carbon monoxide alarm and make sure it is working properly. Read the device or guide so that you know the difference between the danger alarm and an error alarm. That way you don't freak out like me when the error alarm goes off. And if you don't have a carbon monoxide alarm, get one. I'm pretty sure my husband thinks I'm nuts now. 4 years ago my mother had taken a fall and broke her hip, requiring surgery and long term care. She moved in with me and it saved her life. Her furnace began acting up and shutting itself off. When we called in the technician and he went into the home the CO alarm was going nuts. Within 5 minutes of being in the house I was sick to my stomach and woozy. He unplugged the alarm and began using his own meter to test. The levels were astronomical. Had my mom been home and not living with us during her recovery she most likely would have died. I now have electric only heat as does my mom, but I shudder to think what could have happened had she been home when that thing went off. I know her she would have unplugged it and gone back to bed thinking it was malfunctioning. Glad that it turned out to be a "false alarm." a friend of mine, her toddler, and unborn child came minutes from dying of carbon monoxide poisoning about 2 years ago. It's always best to not take chances! They were both unconscious when emergency personnel arrived.